In which G.M. Norton gives his full backing to the Two Piece Tie. If 007 had this to say about the simple Windsor knot, goodness knows what his thoughts would be on more elaborate knots such as the Eldredge and Trinity styles that have popped up in recent years. Personally, I find these type of knots very striking indeed. I love simple and understated, but I also like something a little unusual to satisfy my peacock tendencies. 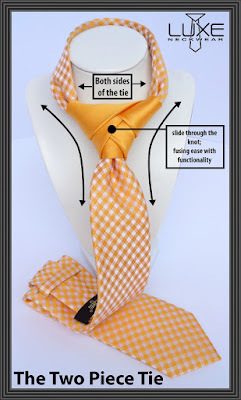 Alas, attempting the likes of an Eldredge knot can be a frustrating experience. It can take hours to perfect and due to the complexity of the tying process, it can make your expensive silk tie look like it’s been in a fight with the neighbour’s Alsatian. Thankfully, chumrades, we have a saviour in the form of Luxe Neckwear and their innovative Two Piece Tie. Luxe Neckwear are an American enterprise, founded by ex-US Marine, Brent Bustamante. The knot and the tie are two separate pieces of fabric. Available in a range of bewildering knots, all you need to do is put the tie over your head, adjust the wide part of the tie so it’s at the length you like to wear and slide the knot so it is snug against your collar. 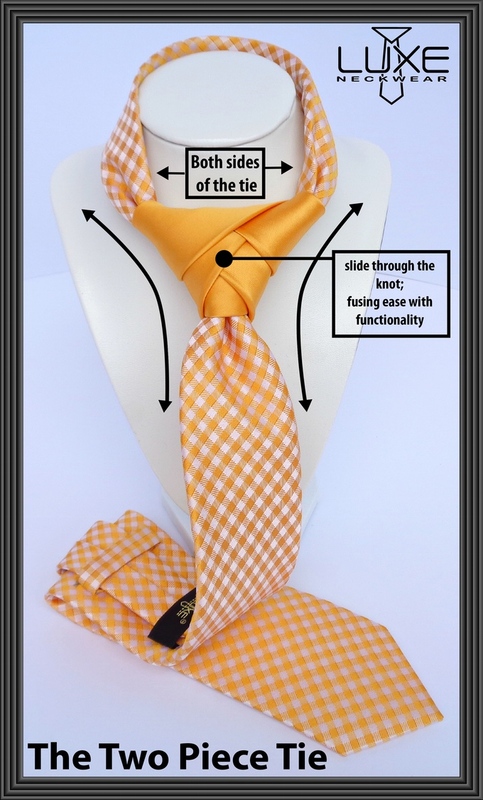 Luxe Neckwear are currently in the midst of a Kickstarter campaign, to help make fancy knots available to fancy people. If you’re a fancy person, do consider backing them with your money. In return, you could have a tie (or more than one) like this burnt orange one I was sent. Made of silk, it has a subtle paisley design. I decided to embrace my inner Kingsman by pairing it with a new-to-me grey Marks and Spencer double-breasted suit (the 6x2 button arrangement) and a plain white shirt. To add a sartorial flourish, I added a golden-coloured boutonniere along with the versatile black and white gingham pocket square. I wore the ensemble to the office yesterday and received lots of favourable comments. The tie was the star of the show, generating a lot of interest in the Eldredge knot. Of course, as the tie and knot are two separate pieces, there are lots of colour and pattern combinations available to inject a little extra fun into your look. Yes, I know that the Two Piece Tie is the easy way out. Pre-tied isn’t something I would normally endorse (on a bow tie, for instance). But in this case, it has my whole-hearted support. It’s not an awful elasticated monstrosity, it’s a thing of beauty. The Kickstarter campaign is running until Thursday 3rd September and the ties will only go into production if they reach their $50,000 target. You can donate as little as $1 (around 65p) which will enter you into a prize draw to win a collection of any 10 ties of your choice. There are lots of other pledging options, with $70 (approximately £45) getting you any tie of your choice, plus your name into the hat for a collection of 20 ties. Crikey! Pledge before time runs out! I personally use the Nicky know, simple and looks good in a variety of materials. It also works well with rounder faced people like myself.